If you've never tried making your own marmalade, we encourage you to give it a go. The result will taste much better than store-bought, and you'll have the pride of mastering a new skill. It might even become a tradition. Below is our entry-level marmalade recipe from guru Christopher's recipe for Thick Cut Seville Marmalade. Seville oranges, so called because they are grown near Seville in southern Spain, are very seasonal. They are only available for a few weeks up to the beginning of February. For quick guidance on shopping, and variations, check out Rachel's top tips on making perfect marmalade. And if you get really into it, cozy up with a cuppa and immerse yourself in Christopher's entertaining guest post on the magic - and science! - of marmalade. 1. Wash the oranges, take out the stalks, and cut them in halves around the equator. 2. Juice the oranges and the lemon, removing all the pips. Sieve the juice into a jug and retain the pips. 4. Put the sliced oranges and lemons into a large lidded saucepan with 300mls of the water. Cover and simmer gently for 60 minutes to soften the peel. Stir often. When ready, the pith will become more translucent and the peel will easily squash between finger and thumb. Turn off the heat. 5. While the peel is simmering, put the pips in a small saucepan with 200mls of water and simmer for 5 minutes. 6. When the peel is soft, add the juice and the sugar then stir until dissolved. Strain the pectin rich liquid the pips are simmering in, and discard the pips. 7. Put the pan back on the heat, and stirring, slowly bring to the boil. 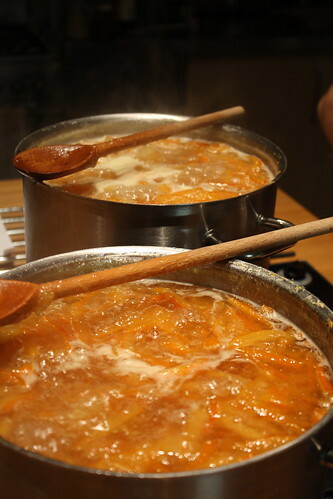 Stir often to stop the marmalade sticking and keep on a slow boil. If a scum forms, lightly scoop it off the surface. 8. Place a saucer or two in the fridge ready to test for setting point. Also place the washed jars (but not the lids) in a medium oven (about 140C) to sterilise them and heat them so they don’t break when the hot marmalade is poured in. 9. Stir the marmalade and keep it on the heat until a rolling boil is reached (about for 30-40 minutes) and setting point will be near. 10. To test for setting point, put ½ teaspoon of the marmalade on the cold saucer in a small 50p-sized circle. Put back in the fridge for 30 seconds to cool, then take out, hold up to the light and push your finger through the jam to see if the surface wrinkles. If it does, it’s ready. If it doesn’t, try again after 1 or 2 minutes. 11. When setting point is reached, turn off the heat and leave for 10-15 mins to allow the peel to distribute evenly through the marmalade. (If you bottle it too quickly, the peel is likely to float to the top of the jars). 12. Pour the marmalade into the jars, holding the hot jar with an oven glove, using a small heat-proof jug or a pouring funnel. Immediately put on the lids, wipe off any drips when still warm. Tighten the lids. Leave the jars to cool before you label. Label before you forget to. For a Dark Marmalade add an extra 250g muscovado sugar. Don’t be tempted to add more than 50:50 muscavado unless you like the ‘molasses’ flavour more than you do the Seville orange. For added flavour add 250g chopped crystalised ginger when you take the marmalade off the heat. You can add the ginger alone or added with the muscavado is doubly delicious. Beginners often end up with jam that either is set like heavy clay, or is as runny as before any boiling. To set into a soft gel, the jam requires acidity, sugar, and pectin and at the right temperature. Marmalade making has enough of all three ingredients and the cooking delivers the right temperature. The trick is to boil it enough to raise the temperature to 105 0C, when the sugar content is about 60-65%, but to do so quickly before both the flavour and the essential pectin are damaged. But this ‘setting’ point is not a precise setting point, and experience shows that some batches will be set but some may have to be increased another 3-50 to get a set. It is more sensitive to use the wrinkle test than the thermometer. The setting point is just that: a ‘point’. Heat for too long at or beyond setting point and the gel will be damaged. You produce a thick mass not the lovely, light gel. The temperature changes slowly towards the 1050C and you may be watching the temperature for a long while before deciding it was at the right point. Heating for too long after setting point will damage the texture and the flavour. There is no harm in testing for setting point too early. The marmalade on the plate will be just a patch of syrup. But you will know exactly when the setting point is reached with the first sign of wrinkling. Repeat the test once or twice more, if you are unsure, until you get a clear wrinkling that remains after your finger has pushed through the patch. Interestingly, the gelling process continues as the jam cools in the jars and even over the first few weeks of storage. This is why it is best to stop boiling AS SOON AS you detect clear wrinkling, knowing that the jam will ease itself into an impressively delicious gel. Boil for too long after setting point and the result is a heavy, stiff set. Making excellent marmalade is an art. The art is in the setting point as much as in the flavours. Simple experience will polish your art and maximize your satisfaction. It would be great to have marmalade tasting sessions where we all share our preserves as it is so hard to really compare different oranges, techniques and marmalade batches otherwise. Marmalade making has so many variables. Are they the actual pans you use for the rolling boil stage, as they are filled so high? I learnt early on to use a wide preserving pan and only third to half fill it so there is plenty of room for the fast boiling jam to rise up in the pan. That way you don’t have the worry of it boiling over the top of the pan and so long as you keep a steely nerve, the intense heat only lasts for the shortest time. Recipe for marmalade looks great and about to try it but how do you make it so that there are no shreds in the final product? My partner only like shredless marmalade. Do you put the peel etc into muslin bags? or sieve it when ready for bottling? Any suggestions please. Yes, tasting would be interesting. Not only are there many different recipes for making basic marmalade, but also many different combinations of different citrus and also different flavourings like ginger and coriander seeds. So much is personal preference, but it is always interesting to see what different methods result in. A tasting session would be far more eficient than swapping the occasional jar, as we all do. Heating the sugar syrup that becomes marmalade requires a lot of heat to get the temperature up. A large diameter pan on a normal hot ring will loose heat so quickly from the large surface area that it will be difficult to heat evenly or efficiently. Certainly if the pan is only 1/3 - half-full, there is more room for the boiling syrup to safely rise up before any risk of boil-over. But I have found that if the fruit is well washed (and the sugar is pure) the best way to heat it is to slowly bring it to the boil and then steadily increase the heat as the water content boils off. Another trick I learned years ago was to use less sugar and less water in my recipe. This means you get a lower yield of marmalade, but with less water to boil off, the syrup boils more calmly and there is none of the rise up the sides of the pan. It also means the marmalade is more concentrated fruit as so is less sweet and has a stronger fruit flavour. This recipe seems unusually well done in its blending of simplicity, sense, and science. However, as with most, it fails to estimate the total amount, so one has no idea how many jars and of what capacity one will need. Could you possibly add this information? Thank you for this additional information about capacity and about the rationale for using less sugar. Less sugar is one of the things I like about most about this recipe and it is great to have more information on this point. Two questions: do you think it would be a mistake to replace all the granulated sugar with muscovado; and do you have anything to say about adding brandy, cointreau, or the like? I even thought of a heretical touch of vanilla. But my basic feeling is that you should just let the Seville oranges do the work . . . . . I love seeing an addicted marmalade maker expanding his options. Marmalade with muscovado is truly delicious. I make a batch every year. Muscavado sugar alone is delicious. But I think the flavour is so strong that using ONLY muscavado sugar would swamp the flavour of the Sevilles. I use about 1/3 muscavado to 2/3 white granulated. There is another minor point to consider too. 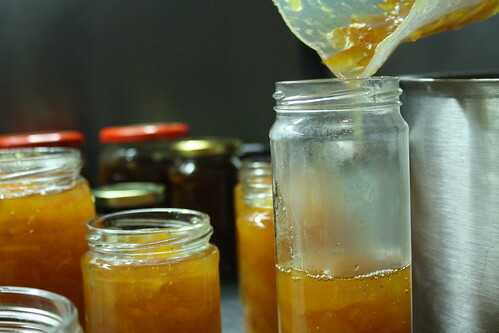 Even with only 1/3 muscavado, you wont get that beautiful ‘jelly’ in perfectly set marmalade. The consistency is thick rather like a conserve consistency. It is still a delicious combination. I am not a pedantic purist about flavoured marmalade. There is a long tradition of using whisky, brandy, armaretto etc. Also of using spices like coriander seed and ginger. I have not tried vanilla and Seville. I would start from how another flavour goes with that delicious bitter orange taste. Chocolate and orange go well, but I haven’t tried it as marmalade. So experiment. I made this recipe (basically!) twice last year and the results were stunning. It is by far the best recipe available. I’m trying it again this year and have a couple of questions. Using about 800kg sugar (1/3 muscovado) to 1kg oranges, the set is very good, even if you take it off on the early side. I’m about to experiment with 1 large lemon per 2kg oranges, and wonder what would happen if you didn’t use lemons at all? Also a question re sterilization and sealing. I get the impression that marmalade is basically spoil-proof. Is that true? That you don’t have to be that fussy? Also, what do you think about aging? I know people who say that marmalade can and should be aged for years, but I found my batch a little less satisfactory at the end of the year. Another question: the amount of water seems a trifle stingy - - you kind of wish the oranges could be covered. When I accidentally put half the amount of water in, it all got absorbed by the oranges within a few minutes. Is it possible that the amount of water needs to be adjusted according to the state of the oranges? Should they be 1/4 covered, 1/2 covered, just covered? Many thanks! One other quandary: I find that with the home electric stove (Bosch, but still awful) I am stuck with at the moment, that it takes a very long time to reach a temperature near 103/104C. Well over an hour. I am sure this is not good! On my first batch this year, I had slight burning/caramelization at the bottom of the pot - - not enough to give a burnt taste, fortunately. Very dark color. I made a double batch - - which hardly seems like any, but still - - would it be better, in home cooking, to keep the batches smaller? And I will be stirring a lot more on my next batches! The set was stiff, even though I used only 1 lemon per 2 kilos oranges. I used also 1kg caster sugar and 500 g light muscovado. I am wondering if I would have got a tenable set at a lower temperature, and am trying to think what else I can do to compensate for poor stove and kettle. I have an exceptionally hot camping gas stove, the Coleman F1 Power PZ which does 7,000 watts or over 24,000 BTU, but I am afraid the marmalade kettle would be too heavy for it? Otherwise I would use that in the last stages of cooking to try to reach the set point quickly. Many thanks. Many thanks, Christopher. I will sterilize. But is there a better technique than using tacky little wax paper inserts where you can never quite tell which is the waxed side and which don’t have enough wax anyway? Is there a wax (preferably vegetable, but who really cares at this point?) I can melt and pour into the jars? Yes, the set is _great_ although I think I overcooked this last batch. I use Tesco Light Muscovado, and apologies for writing 800 kg instead of 800 g. I actually doubled all these amounts, which I think is one of my problems, but smaller quantities hardly seem worth it. I have a Kenwood Cooking Chef, so I am going to try using that. To what extent should marmalade be covered when cooking? I always cook uncovered. Sorry to have so many questions, but your recipe is worth it !! I am thinking for the next batch I will use a little bit more sugar - - not quite 1:1, but a bit more than the 0.75:1 I did in this batch. Thank you for your contribution and for appreciating the 3 Ss in our marmalade recipe. Simplicity, sense, and scientific. I feel too many people are frightened of trying to make marmalades (or any jam for that matter) despite the overwhelming delight at eating the product compared to commercial options, and the inherent simplicity of the method. Our ‘grannies’ weren’t stupid in how they did most household activities, especially preserving seasonal foods and particularly jam making. Secretly, were it not for the jars associated with jam, I think it is a good possibility that marmalade was the biblical manna. But I could be wrong. 5kg Sevilles plus 5kg sugar plus 2 1/2 litre water gives 10kg marmalade. Using some of the more common recipes where they use 2 kg sugar to 1 kg of fruit, they should expect about 3kg marmalade, or multiples. So with 5 kg Sevilles and 10kg sugar, expect 15kg marmalade. And don’t forget to put the lemon juice in too, but of course but it doesn’t affect your basic calculation.This is a basic estimation. You may end up with a jar or two more or less that you calculate, depending on how much water is boiled off, but just allow for that. BUT remember that using a ratio of 1:1 fruit to sugar gives a beautiful bitter marmalade with a strong orange flavour, but using 1:2 fruit to sugar dilutes both the bitter and flavour elements of the fruit with a strong sweetener. The product is very different. Yes you get a little more jam (half as much again) but it is just sweeter and less bitter than the 1:1 ratio.The I:2 ratio recipe also gets you a product more like commercial options. If you like bitter, strong-flavoured marmalade, and want more jars at the end, just buy more Sevilles. You can even work backwards, easily. If you want to end up with about 20lbs marmalade, use 10lbs Sevilles and 10 lbs of sugar. If you have only 15 x 1lb jars to hand, simply used 7.5 lbs of Sevilles to 7.5 lbs sugar. This is a basic rule,and it is simple, scientific, and satisfies. PS: The same basic rule applies to making other jams like strawberry, blackcurrant etc. Just add the weight of fruit and the weight of sugar to get weight of product. BUT please remember to be consistent in using either metric or imperial measures. Richard, I had a dear friend years ago who told me she had taken all the peel out of some marmalade I had given her, and discarded it…She never received another jar. But since it is your current partner you are thinking about, I have some suggestions that may preserve the relationship and your marmalade. The bitter flavour is in the peel of the Sevilles, so you need to get that out. The membrane and pith contribute to the pectin, so you want to extract as much of that as possible. I would do two things, First, I would juice the oranges as before and set aside. Then I would chop coarsely the peel with the membrane attached, as before, as set aside in a pan with a lid. Second, I would use 2L water for each 1 kg Sevilles, and have up to 2kg white sugar available. The original 2 lemons will be enough. Then modify the method slightly. Place the chopped peel, the membrane and the seeds in a large pan and add the 2 L water for each 1 kg fruit. Bring to the boil and simmer, lid on, until the peel is tender to bite. This may take an hour. Then strain the contents of the pan through a large kitchen strainer and discard the peel and membrane residue. Measure the strained liquid and pour it into the now empty pan. Add the Seville juice. Then for every litre of strained liguid, add 1 kg whole sugar. (eg. If you get 1.6 L liquid, add 1.6 kg sugar). Stir in the sugar, then bring slowly to the boil, stirring the sugar frequently until dissolved. Increase the heat to produce the active boiling action and test as before until setting point is reached….. I think using this method is best as it bypasses the fiddliness of putting all the peel and seeds in muslin, which also reduces the extraction rate from the peel etc, and is just more messy. TIP: If your partner can tolerate the thin zest of the fruit, then zest the oranges before juicing them and add the zest to the juice and add it with the juice the strained liquid before adding the sugar as above. This will look pretty and will increase the Seville flavour in the marmalade. I am glad you have success with out recipe and also enjoy the product. It is interesting that you get such a good set with the 1/3 muscavado sugar (I hope you mean 800g NOT 800kg, but maybe you just love marmalade? ), as the muscavado does tend to produce a delicious but softer gel. The sevilles are a bitter fruit but not so acidic. The setting is a reaction that requires pectic, acid, and sugar, which is why the lemon juice is added. You can leave the lemon out, but risk a weaker and inconsistent set. No problem with 1 large lemon to 2 kg sevilles. I have used even fewer, with only 1 lemon to 3-4 kg sevilles. I have not heard that marmalade is ‘spoil-proof’ and have seen jars develop mould colonies. But, because you are making basically a sugar-rich mixture (but not a saturated solution like honey that is sterile) bacteria and fungi are likely to colonise it given the chance. I sterilise. My approach is because I make marmalade only once a year, and adore it, I will reduce the risk of spoilage by sterilising the jars before bottling. After opening a jar, the risk of spoilage increases. Some people keep opened jars in a fridge, but I find no need as my jars will be eaten within 2-3 months. Remember that jam making is a preservation technique not mere chef’s artistry. Your marmalade should last perfectly well (in sterilised jars!) 5 or more years. But keep your treasure in a cool, dry, and dark place. Even light will lead to deterioration. Before I left London, I used to keep a jar of every batch of any jam I made. I had 20 year’s worth of pleasure in my archive. The only jars that had dried in the top layer were the few that had only wax paper and a cellophane seal on top. These did not have any bacterial or fungal colonies, presumably because the drying top layer must have been close to saturated sugar, which is antibiotic. That fresh flavour of marmalade will of course reduce but you will still get interesting maturation with you ageing. Hello, Christopher…I am looking for some expert advice, please! In clearing out our freezers ready for the glut of turkey, and ham stock about to occur, I have found my secret stash of Seville shreds from earlier this year, together with the cooking liquid and the ‘must’ ie pith, seeds, membranes. Unfortunately no note of ‘original’ weight. The already cooked shreds (I usually boil the oranges whole til soft then scoop out the insides/must to reboil in the liquid) weigh 663gms; the must 226gms - and the liquid (juice and water) is just over 1 litre (or at least my clever weighing machine says it’s 1066ml. Bearing in mind that the peel and insides will have lost weight (?) whilst boiling? How much sugar do you reckon? Using good old granulated. Grateful for any (helpful!) suggestions. And yes, I don’t know why I’m even contemplating making marmalade at this particular date either! 1. Can you use frozen lemons? (The reason is that it is sometimes possible to get them on sale; when defrosted they are mushy but I can’t think it would make much difference. 3. Last year I experimented with minimal lemons (1 per 2 kilos oranges) and found that it could take an hour to reach the setting point; while with a more reasonable amount (3 lemons per 2 kilos oranges; 1800g sugar of 1200 caster and 600 light musc) the setting point could be reached in 15 minutes or less. As your technique focuses on cooking the oranges as little as possible, I imagine you would not encourage this minimal lemon approach? The results were great, but it is also nice with a more normal amount of lemon. 4. Just a note, I found that the Kenwood Cooking Chef will make a 2kg batch very well, but it is important not to raise the heat to its highest setting (140C) as this encourages scorching. Setting the heat to 120 seemed to work fine, and I will try it lower this year. 5. I discovered that it is not a good idea to insert a Thermapen into the Kenwood when it is in motion. Greetings and welcome to 2015 marmalade season…. It is difficult to say why your marmalade may not have set when you emailed, however it seemed to be still warm and you will have to leave t until it is cool to see if it is set. Setting usually wont take place until the temperature is 103C or maybe up to 105C, but if you were below 103C when you removed from the heat it may not set. (And note you didn’t do the wrinkling test, which will show you if you are at setting point, because the wrinkling confirms just that. Setting requires 3 things: pectin, heat, and sugar in sufficient quantities. With Sevilles, they are available for such a short season that it is possible you could get some very ripe to over-ripe fruit. That will lover both acidity and pectin, which could be a problem with getting a good gel. Sometimes you could be heating too long , either NOT getting a gel forming, or even going beyond the setting point and getting the darker and ‘heavy’ consistency you describe. Personally I don’t like the thermometer method. the closer you get the batch to 103C, the slower the temp rises and the easier it is to heat it beyond setting point and for too long too. remember that the higher and the longer you heat the mixture the darker it will become and the less you will get a good ‘jelly’ set. Muscavado will make for a great taste, but it also will not give you the same light gel set you get with just white sugar. You normally don’t need to add a lemon, but with very ripe fruit you may get low acid so the lemon is a good insurance so you know you have enough acid. Thanks so much! Let us know how it goes if you get the chance to give it a try! Hi Christopher, I’m now on my 4th year with your recipe, and have already done 4 batches. Normally I cook to 104 (measured with a Thermapen) and the first true wrinkle, but have had comments from people who prefer a looser set. Another batch was more like 102 to 103 and the plate taste gave not a true wrinkle, but definitely a gel-like consistency. People seem to prefer this looser set (it’s not pourable) - - do you think this is OK? Apologies for asking variations of this question for years now. Other notes: am trying adding bergamots to the Sevilles, and so far so good - - any comments on using them? Also have noticed that Waitrose organic Sevilles are much more intense and tasty than Sainsbury non-organics. Finally have noticed that NOT making double batches leads to a much more pleasurable and controllable cooking experience. I have been making marmalade for years, but this is the best recipe I have used. I love the reduced quantity of water and sugar - it makes for a much more lively and punchy marmalade. When I sieved the pips and pith, I managed to squeeze out far more pectin than I’ve ever achieved when using muslin. I don’t know whether it was the reduced water, extra pectin or both, but my marmalade achieved setting point (wrinkle test) in 10 minutes. Thanks so much for sharing this recipe.